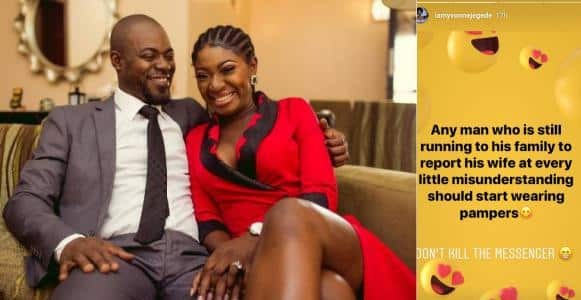 Popular actress, Yvonne Jegede who recently shared her pregnancy photos has slammed men who report their wives to family members. 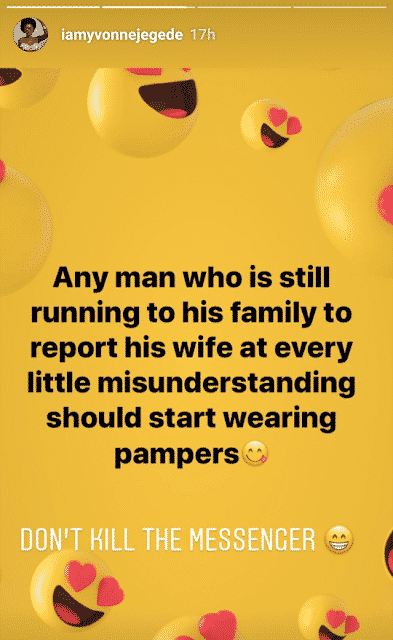 Yvonne Jegede said men who do this should start wearing pampers. Yvonne Jegede who is married to rapper Abounce recently opened up on the marital crisis she’s facing. “We started having issues before the birth of Xavier (their son). I think I was about two to three months pregnant when the issues came. Immediately the issues came, there was never a dull moment, it just kept going up and up and it got worse and it got bad and today here we are,” she said. Jegede who also responded to rumours about the paternity of her son Xavier, saying Abounce “is 100% sure he’s his son”.